The information provided about Small Claims is not intended as legal advice, but to help you understand the Small Claims process. If you have any questions, you should contact an attorney or your local Bar Association. What cases can the Court hear? Most claims for money damages of $6,000 or less, plus interest and court costs. Small claims court cannot order the return of property. Anyone over the age of 18; anyone under the age of 18 through a parent or guardian; and a corporation or limited liability company through its officer, salaried employee or attorney. By law, if you are an officer or salaried employee of a corporation or limited liability company you will only be permitted to present the company’s claim or defense, but cannot engage in cross examination, argument or other acts of advocacy without an attorney. You can file your claim in Marion County if the transaction or incident took place in Marion County or if the defendant (or any one defendant, if there is more than one) lives or has its principal place of business in Marion County. You will need to come in person to the clerk of court’s office and file either a legal complaint or the Small Claim Information Sheet. You must provide a statement of your claim and the names and current addresses of each person making a claim or liable for the claim. A filing fee of $55.00 is due at the time of filing. Also, a $20.00 trial fee is due immediately following your small claims trial which is the plaintiff's responsibility and is added to court costs. I've been sued! What do I do now? If the claim is fair, you may pay the plaintiff the full amount of the claim and court costs. If you disagree with the claim you may file an answer with the court stating your defense (although this is not required). You may also contact the plaintiff and try to settle the dispute. Regardless of whether you file an answer, you must attend the trial at the date and time it is scheduled. Failure to attend may result in a judgment being entered against you. If you have a counterclaim against the plaintiff or cross claim against another defendant, you must file it with the clerk of courts at least seven days prior to the date of the trial. The clerk must be notified in writing if a settlement is reached or the claim is paid, otherwise a trial will be held and all parties must attend. The person making the claim must prove it by a preponderance of the evidence, which means it is more likely than not that the claimant should prevail. The court may only consider the evidence actually presented at trial. You must come to your scheduled trial prepared to prove your claim or defense to the best of your ability. Anything that can support your case may be useful as evidence, including your own testimony, witnesses, documents, photos, etc. Certain kinds of testimony may be especially useful. For example, a professional repair person could be a good witness when poor or incomplete workmanship is an important question. Friends, neighbors, or bystanders who are familiar with the incident or transaction may be witnesses. If you wish to require a witness to attend, you must pay a fee and file a request for a subpoena with the clerk of courts well in advance of the trial date. What if I do not appear at the trial? Failure to appear at the trial means you might immediately lose, regardless of the merits of your claim or defense. If you are a party to the case, you must appear. Any continuance of the trial date must be by agreement of all parties or for good reason shown to the court. A continuance is rarely granted without agreement of the parties. What do I do at the trial? This is your day in court. There will be several trials that day, each scheduled in 15 minute intervals. Please arrive on time and check in at the clerk’s office. Because some cases will take more than their allotted time, be prepared to wait for your case to be called. Small claims cases are heard by a magistrate. Before your trial begins, the magistrate will give you an opportunity to work out a settlement with the other party. If you reach a settlement, an agreed judgment entry will be prepared. If you cannot reach a settlement, the trial will begin. The court will not order a deadline for payment unless by agreement of the parties. Bring all of your evidence and witnesses with you. The magistrate can only consider the evidence it receives at the trial. The plaintiff will present its case first. Once the plaintiff is finished, the defendant can present its case. At the completion of each witness’s testimony, the court will allow the other parties to ask that witness questions. The magistrate may ask its own questions. Answer all questions directly, politely and to the best of your knowledge. Be brief and stick to the facts relevant to the claims before the court. Remember, good manners and a calm, orderly presentation promote the fair and efficient conduct of the trial. Each side may make a brief closing argument at the end of the trial. The magistrate will most likely take the matter “under advisement.” The magistrate will carefully consider the evidence presented by both sides and prepare its recommendations for the outcome of the trial. The clerk of courts will mail these recommendations to each party along with an explanation of the objection process. Ultimately, the judge will review the magistrate’s recommendations and any objections that are filed and render a final judgment. The clerk will mail a copy of the final judgment to the parties. It is your responsibility to keep the clerk of courts informed of your current address. How can I collect my judgment? Once the judgment is issued, the debtor can voluntarily pay the amount due. If the debtor does not pay, it is up to the creditor to collect its own judgment. The creditor may chose to garnish the debtor’s earnings or bank account; to attach the debtor’s personal property; to obtain a lien against the debtor’s real estate; or to take any other actions permitted by law. Many of these processes require filing documents with the court and paying additional fees. The court cannot give you legal advice to help you collect your debt. 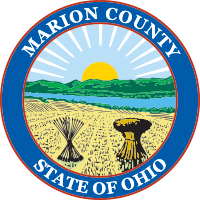 You may print this form ( Small Claims Complaint) and take it to the Marion Municipal Court, 233 West Center Street, Marion, Ohio 43302, City Hall Building, 2nd Floor to file, or fill one out there. Small Claims Complaints must be filed in person, as the person filing the complaint must sign in the presence of a Clerk.